Mannschafts WM 2014, Tokio. Halbfinale, China vs Taiwan. Asian Cup, Wuhan, China. Finale Herren. Krasses Match! Asian Cup 2014, Wuhan, China. 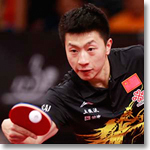 China Trials for WTTC 2014.